If you’re not already invested in the Philips Hue ecosystem, we should warn you that Hue products are very expensive. Don’t get us wrong — they’re awesome, but expensive. 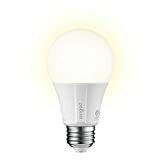 Those of you looking for a simple smart lighting solution that can integrate with popular voice assistants like Amazon Alexa and Google Assistant should definitely check out the Sengled Element Classic A19 Smart LED Bulb, which is a great low-cost option for people in search of a reliable smart light bulb that won’t break the bank.